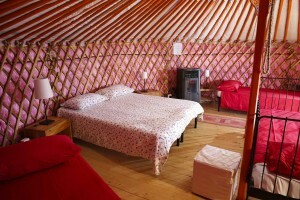 Every Yurts is equipped with eletricity, eletrict socket and pellet stove for the winter months. If you want know the prices for your stay please contact us or check our page. It ‘s the first to be mounted to assess the resistance to different weather conditions and to understand what improvements were needed. 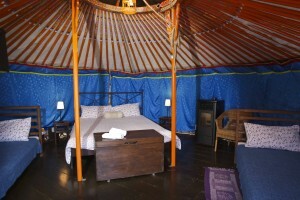 It is furnished with a double bed and a single one. 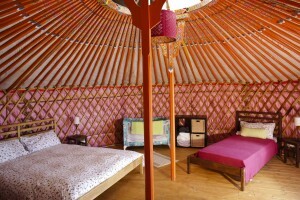 The Yurt is placed on a wooden platform of about 36 square meters and its interior surface is of about 25 square meter. 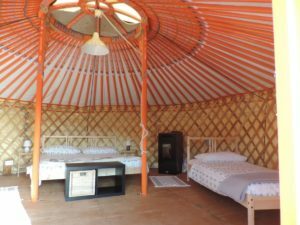 Comfortably furnished, accommodates up to 4 people, like all the others is equipped with electricity and light. There is a double bed and two single onces. Laid on a platform of about 64 square meters, it has 30 square meters of indoor area. 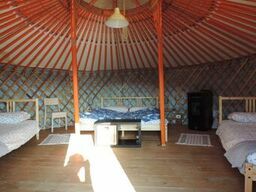 A big yurt that we have equipped just for four people. Like the others it has settled on a 64 square meters platform. 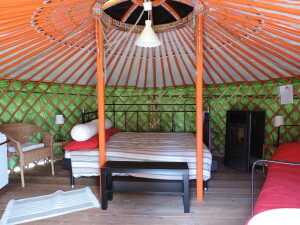 Inside there are a comfortable double bed and two singles. 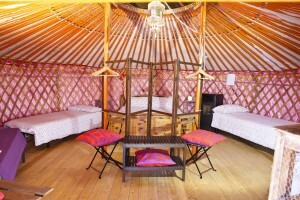 It ‘a big Mongolian tent with 6 beds, a double bed and four singles. Based on a wooden platform of about 64 square meters it has a surface area of ​​about 36 square meters. 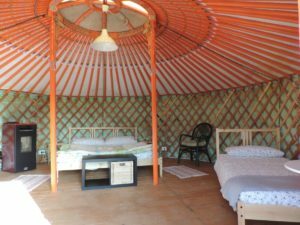 It’s a big Yurt with six single beds.